Concrete patios are every bit as enduring as concrete motorcourts and driveways. The advantages to having contiguous hardscape design throughout your property are obvious. Aesthetically, it lends continuity to the landscape master plan. A well-laid slab that is properly designed will last for years without deteriorating in quality. Some of the old concrete structures built by the Romans two thousand years ago are still partly intact today. Having such a durable material as the primary material for your hardscapes adds value to your investment in landscape design in the form of features that do not require maintenance. Concrete patios can be built anywhere in the yard. Most commonly, they function as transition areas from the living room or indoor kitchen into the exterior world of the back yard. Because concrete is poured into a mold, a patio made from concrete is very easy to customize to the rear exterior of a home. 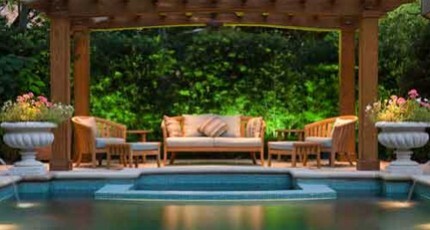 Any number of geometric themes can be selected to function as the primary motif for a patio. Quadrilateral designs can be used to compliment the linear movement of home architecture, then extend it in specific directions into the yard. Radial-based designs add flair and sophistication to home exits. Imagine stepping out onto an ornamental, concrete surface whose outer edge sweeps from left to right in a circular movement. This provides all sorts of custom garden design opportunities, along with many options in adjunct masonry design and walkway construction. Decorative effects can be added to concrete to make it highly aesthetic. Sometimes something as simple as brushing its surface can create a rich and vibrant texture that adds a subtle, extra dimension to its presentation. The added functional benefit you gain from such a surface is amazing traction when the concrete gets wet. Another way to make any concrete patio aesthetic is to stamp it with highly ornamental designs, then color its surface. Colors can now be mixed to emulate anything from pure, natural stone, to sandstone, and even the fine colors and textures of wood. Imagine having a wood patio that is actually made of something far more durable than wood. Such a surface is ideal for the rainy Houston landscape and heavy humidity content of our air. Concrete hardscapes can also be rendered superbly aesthetic by combining aggregate with geometric shapes and patterns made through our stamping and coloring process. Patios built in this manner can be used to establish the entire aesthetic of a contemporary landscape design by creating strong, metallic colored circles and radiating lines that shoot out from central focal points. Often a contemporary fountain is placed in the center in order to lend vertical impact and to act as a focal point. 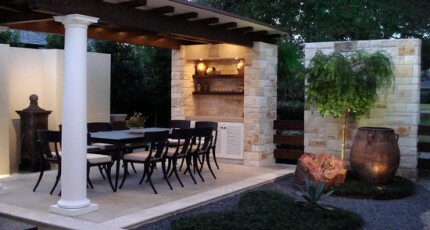 The value of a concrete patio is not limited to contemporary design. It can be used to enhance any home architecture or residential landscaping master plan. The reason for this, again, is the ability to render the surface into any texture and color necessary to support surrounding aesthetics. A very strong that decorative concrete offers over other building materials is the ability to be cost-effectively rendered into any form needed to compliment surrounding geometry, scale, and form. While we by no means claim that all colored concrete patios, driveways, and hardscapes are by any means “cheap” by the cliché definition, they are certainly less expensive than high-end luxury stone materials or rare masonry supplies that by their very nature represent an enormous investment in front in material costs alone. With concrete patios, you essentially pay for the base cost of concrete, and then pay your landscape designer for his or her time in developing its shape and color.